Early last month, I took a two-week road trip to attend the Quebec city and Merritt Parkway meets on consecutive weekends, and cover some untraveled territory before, between, and after the meets. This was basically a triangular trip, from home to Quebec to Detroit and then over to Connecticut before heading back home, but with lots of shunpiking and other indirect routes along the way. This report covers the rest of my trip. On my way to the Quebec city meet, I started off on the "Trail of Tolls" between the Washington D.C. and New York City areas, stepping off in Fort Lee NJ to use the George Washington Bridge entrance that was the focus of the "Bridgegate" scandal. I continued to Bridgeport CT, where I left I-95 via CT 25 (a "most desolate freeway" candidate nominated on this forum), to connect in New Milford CT to the part of US 202 I hadn't already covered. I spent the next day and a half doing the slow crawl up US 202 to its end in Bangor ME, with overnight stops there and along the Mass. Pike. After the stop in Bangor, I headed southwest a few exits on I-95 (maximum speed limit there 70 mph -- I wound up skipping the 75mph part of I-95 north of Bangor), to Newport to pick up the part of US 2 in Maine I hadn't traveled, then continued on US 2 east to Houlton, US 1 and US 1A to Van Buren, then crossed into Canada at St. Leonard NB. One interesting feature of that border crossing is that auto traffic into Canada has been rerouted so that Canada's border agent is on the passenger side of the incoming cars, rather than the usual driver's side. So for solo travelers like me, the agent had use a mechanical arm to reach into my car and pick up my passport, then return it at the end of her mercifully short and pleasant interrogation. From there, I took the west end of NB 17 (clinching that highway) to the Trans-Canada Highway, then drove into Quebec after some shopping in Edmundston NB. After an initial check of the newest Autoroute 85 segments (unpleasant weather that day, so I just drove straight through while taking mental notes on things to go back and cover the next day), and a brief jog east to check whether Autoroute 20 had been extended further east (no, it still ends at exit 527), I stayed overnight in Riviere-du-Loup, at a Comfort Inn where I'd stayed twice before (pretty average place, I might try something different next time). From there, I went back south on A-85 to take photos and notes on the new A-85 segments and ongoing construction, as well as to try unsuccessfully to score some postcards to send my nieces from the funny-name town of St.-Louis-du-Ha! Ha! That took most of that day, with the rest spent to get to the Quebec city area where I stayed the next three evenings. I made a point of getting to the city a full day before the Saturday meet, so I could do some tourist stuff including a guided tour of the National Assembly (provincial parliament) building, which I'd heard has some gorgeous stained glass windows (it does). 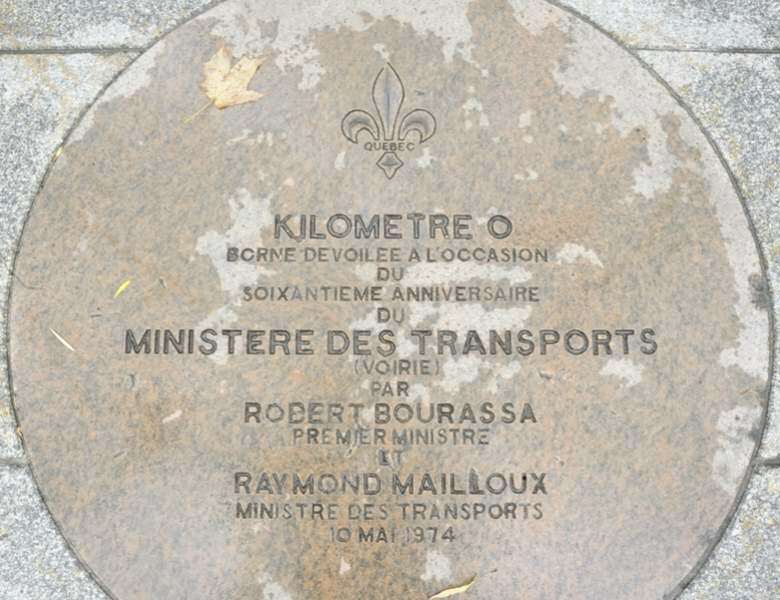 ^ While waiting for my English-speaking tour to begin, I wandered around the building, and came upon this "kilometre 0" stone placed near the main entrance in 1974, marking the 60th anniversary of Quebec's Ministry of Transports. Had I been able to translate the stone on the spot, I would've looked around some more for a 100th anniversary stone on the National Assembly grounds. Also that day, I traveled all of A-73, including both the segments south of the city (link to the separate post, with lots of photos, above), and also the shorter segment north of the city. The freeway had been extended north several exits, to its final exit 182, since my last visit. But the FIN (end) sign for A-73 remains at exit 167. North of there, the freeway's route signage is still as QC 175, and its kilometer posts are based on distance from QC 175's south end rather than the longer distances for A-73 which seem to reflect distance from the U.S. border (not that A-73 is going to be extended to the border anytime soon). I'm puzzled why A-73 hasn't yet been extended north to exit 182, it looks completely up to Autoroute standards and its exit numbering seems to contemplate a northward extension of A-73. I also continued on QC 175 to QC 169 about halfway to Saguenay, to fill the biggest gap in my coverage of QC 175. That is one long and boring, but fast, four-lane divided, and well-traveled, road through the largely unpopulated area between Quebec and the Saguenay area. It has two unusual features for Quebec: a 100 km/h speed limit for a non-Autoroute provincial highway with at-grade intersections, and also median crossovers where U-turns are explicitly allowed (on other highways, such U-turns are explicitly prohibited). After I was finished with Quebec city, I drove down A-20 and A-55 to Sherbrooke, traveled A-410 (extended one exit since I was last there), then over A-10 to the newly-extended A-35, through Montreal to Labelle so I could close up a possible gap in my coverage of the Trans-Canada Highway, then down QC 321 and A-50 to snag the newest segment of A-5 to Wakefield. Between all those new Autoroute segments and the newer ones on A-73 and A-85, it was nifty that Dr Frankenstein scheduled the Quebec road meet around the end of construction season, so I could snag all of this year's Autoroute extensions (but there will be more next year). Then I overnighted at a hotel near Ottawa's airport. I was a little surprised the airport doesn't have a better connection to Ottawa's freeway network. On Canada's Thanksgiving Day, I took a long but boring drive through Toronto (side trip on the newly extended ON 404 freeway) to Leamington ON southeast of Windsor. On the U.S. side of the border, it was Columbus Day, which to the extent it is celebrated at all is full of mattress sales. In Canada, just about nothing open but traveler services. Those included the convenient ONroute service plazas all along ON 401, with fast-food counters and gas stations, unlike for U.S. Interstates where such plazas exist only on toll roads. (Quebec has some service plazas on its Autoroutes, but with much thinner service selections.) At one ONroute plaza where I stopped for breakfast, there were several dozen people in line at the Tim Hortons, but almost no line at the Burger King which also was serving breakfast. I used Leamington as a base camp for a day trip to Pelee Island, Canada's southernmost populated place. I understand it also is one of Ontario's newest county equivalents, separating from Essex County to become something like an independent city. Since I hadn't been there before, I wanted to re-complete my coverage of Ontario's counties there. mob-rule.com hasn't caught up with the new Pelee Island county equivalent in Ontario, nor the one for Cornwall, though I'd been to the latter long ago (it's also missing two new ones In Alberta province). Pelee Island is ahout an hour and a half by ferry out of Kingville. In the summer, there is also service to and from Leamington, and Sandusky OH. The latter would've been perfect for me on the return from Pelee Island, but Sandusky service was closed for the season, so to and from Kingville was the only option for me. The island was pleasant to drive around. I drove its coastal loop route (unnumbered, no provincial King's Highways there), with a mix of paved and unpaved roads. The island seems extremely bicycle-friendly, with a bicycle rental store just a few blocks north of the ferry terminal, or you can take your own bike on the ferry. When I was there, both the island and ferry were uncrowded, but it seems a popular summer destination with many beaches and B&Bs. ^ My three-and-a-half hour stay on Pelee Island included a visit to the Fish Point nature preserve, where I hiked to the southernmost point on the island, which is also Canada's southernmost publicly-accessible land point. Behind and to the right of Fish Point, in the photo above, is what I think (but am not 100% sure) is Middle Island which has Canada's actual southernmost land point. Middle Island is a marshy conservation area closed to the general public. A Pelee Islander told me it is surrounded by unwelcome signs warning boaters not to land there. The day after my visit to Pelee Island, I headed back into the U.S., via ON 3 to Windsor and then the tunnel across into Detroit for a change of pace since I'd crossed on the Ambassador Bridge on earlier trips. Along the way, I saw lots of construction on the extension of the ON 401 freeway, along ON 3 and the western part of the E.C. Row Expressway to the Ojibway Parkway, within striking distance of the planned new bridge to Detroit. I didn't take pictures, due to time pressure and the shortage of safe places to pull off in the construction area, but someone else might be able to get some good photos of the project. The Detroit border crossing went smoothly (I've been luckier with border crossings this year than before). The agent was pleased when I told him I'd just visited Pelee Island, and he seemed to think that a non-suspicious reason for a Virginian to return to the U.S. in Detroit after entering Canada in New Brunswick. From Detroit, I curled around the west end of Lake Erie, to make my way to the Merritt Parkway meet, and do some route clinching along the way. Basically, I took OH 2 from I-280 to Sandusky, then US 6 (re-clinching that highway by covering a recently-realigned segment) and US 250 to the Ohio Turnpike, then over I-80 to snag most of PA 309 and along the way fill the last gap in my coverage of US 209, then in Philadelphia back on the Trail of Tolls to Stamford CT the evening before the Merritt Parkway meet. After staying another night in Stamford post-meet, I made my way home, tying up some loose ends from the meet (including clinching both CT 137 and NY 137, and both of the Connecticut segments of NY 120A), then driving around Long Island to complete my coverage of its major parkways including both the Northern and Southern State Parkways. Once I got to New Jersey via Staten Island, I detoured to finish off NJ 34, before one more trip down the Trail of Tolls from New Jersey Turnpike exit 7A (I-195) to get home, about 5000 miles after I'd left two weeks earlier. Any idea why? Construction? Or just customs making bizarre traffic patterns because that's what they like to do? The only thing I can think of is that it frees up more spacious inspection lanes on the other side of the building for incoming trucks. The lane now reserved for cars is too narrow and curvy for trucks, which also rules out using that lane for all U.S.-bound traffic including trucks (which would be a simpler and more standard traffic pattern, keeping all traffic on the right). OK, I finally looked at that station on Google Maps... short version: WTF? Long(er) version: I've seen how the more rural stations tend to be next to the road rather than on the road (requiring all traffic to exit), but this one takes the cake. Not sure what they were thinking with this one! It sounds like between the arctic travel and this that you travel through Canada quite a bit just for the heck of it. Do the friendly border defenders give you any grief for this? They always seem very big into ascertaining my motivations. Well, it's not just "for the heck of it", there's usually a method to my madness, which is what the border people seem to be looking for. My least plausible plan (a short winter trip to Ottawa and back through Montreal, with a hidden agenda of snagging new Autoroutes and scoring several boxes of Canadian Twinkies while they were out of production in the U.S.) got me secondary searches both entering and leaving Canada.